It's easy to dig yourself into a hole in Vegas, but bulldozing your way out of it usually isn't an option, unless your bulldozer is made of tons of cash, although then it would probably be a terrible bulldozer, so nevermind, it's still really hard. Get behind the wheel of a real one, thanks to Dig This. From a New Zealander who had a literal blast (!) 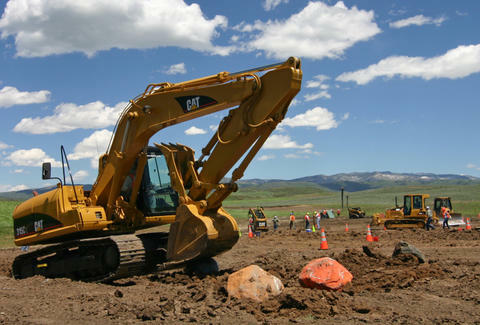 excavating his own CO property, Dig This is a jive talking heavy equipment playground sitting on five acres of former amusement park and letting you back that...backhoe up to your hard-hatted heart's content. Their arsenal includes a deadly duo of mechanic mayhem: a 15T Caterpillar Track 315CL hydraulic excavator, and a 10T Caterpillar D5G bulldozer, not to be confused with Bulldoozer, though you'd be pissed too if a bunch oversized furry socks kept on eating your beautiful buildings. You'll helm said mechanical monsters in individual work areas, completing mock construction tasks such as digging 10ft trenches, building mounds, bulldozing rocks and boulders, and completing obstacle courses, which, if actually a routine task, explains why every single highway in the country has been under construction for the past 10 yrs. If the norm's not enough, Dig even plans to unleash monstrous Caterpillar 330s, D7s, and D8s on specially designated Mega Days, also what you must have been in all weekend to dig yourself into such an epic hole.